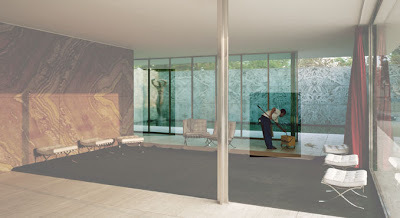 “…cleaning is mysterious, since it is a labor that erases itself if it is successful.” – Jeff Wall. The pavilion – the “site” of Walls photograph above – is itself a reproduction of the original pavilion designed by Ludwig Mies van der Rohe as the German National Pavilion for the 1929 Barcelona International Exhibition. It is interesting to consider Wall’s photographic work in the context of one of the most influential objects of “modern” architecture – the Mies pavilion “original” only existed relatively briefly – about a year actually, but what became of that brief existence is an overwhelming influence upon a “modern” architecture. Work began in 1983 and the new building was opened on its original site in 1986 completely re-assembled and reconstituted. A “complete” replication of the original. Explore more about the pavilion here. 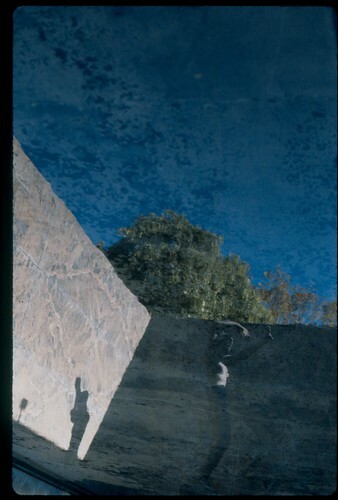 This entry was posted in Art Photography, Inspiration, Other Artists, Photography, Sculpture and tagged architecture, Barcelona Pavilion, Georg Kolbe, Jeff Wall, Mies, Mies van der Rohe, sculpture by Matt Niebuhr - West Branch Studio. Bookmark the permalink.